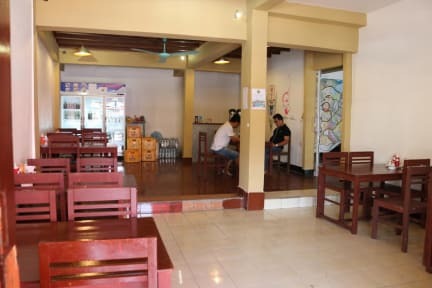 The dream Home Hostel is located in the heart of Vientiane. The surrounding area hosts a large number of Authentic Lao food options, Markets, Foreign Restaurants, Bars, and the Famous Mekong River. Everything is walking distance from our Dream Home Hostel! The Dream Home Hostel offers dorm rooms of 16, 10, 8, 6, or 4 beds. All have air conditioning, and Wi-Fi. Each bed has a personal Bed side reading light, power plug, and storage space. The Bathroom has powerful, hot showers. Prices include a free Western Breakfast selection for you to choose from and served every morning. Other Good Quality Backpacker meals are available for purchase throughout the day. 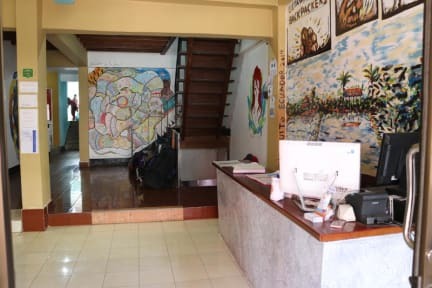 The friendly, English-speaking staff creates a very friendly atmosphere for travelers to relax. The entire property has been painted by inspired travelers. The common areas include a front patio, bar with pool table tournaments. Other amenities include laundry service, towel rental padlocks for sale. We can also provide all your onward transportation bookings whether, Air, Bus, Train, visa service, and motorbike or bicycle hire. COME AND ENJOY YOUR STAYING AT DREAM HOME HOSTEL because We offer everything you need ! COme as a stranger , leave as a good friend ! - Happy Hour from 8pm and 9pm to 10pm everyday . - FREE WHISKEY every night. - Airport Pick Ups service . - Chill-out floor with a pool table, football. This is our guests' favourite part of Vientiane, according to independent reviews. Our property also has one of the best-rated locations in Vientiane! Guests are happier about it compared to other properties in the area. Our property is also rated for the best value in Vientiane! Guests are getting more for their money when compared to other properties in this city. We look forward to showing you an unforgettable stay in VIENTIANE - Paradise in Lao ! We came here for the second time, and Anna was so nice to us! It felt a little bit like coming home :) Thank you Anna for everything you did for us! Really nice hostel. Clean hostel with a good location. Friendly staff with a very cute puppy. The only thing I missen were good lockers. The beds were hard and underneath your bed there were "lockers" but you could still get in after closing it. The people were very nice and the hostel was clean. Location was okay and the wallpaintings are interesting. Onze kamerdeur kon niet op slot. Het ontbijt was prima! Je kon tussen een paar dingen kiezen. De wc’s waren niet echt schoon. Wel fijn dat er veel verschillende wc’s waren. Denk dat er een gleuf niet goed was afgeplakt van het raam want er waren onwijs veel muggen. Het zwembad hebben wij niet gevonden wss aan de andere kant van de straat ofzo. Prima om 1 nachtje te slapen maar verder ook niet. De ramen sloten niet goed in de kamer, de douches waren vies en er hing geen fijne sfeer. Daarnaast kon onze kamer ook niet op slot en kon iedereen de dorm dus in. Ontbijt was wel erg lekker. AC isn't really working so it's super warm, rooms are stuffed with musquitos, the sheets are extremely dirty (among other things yellow sweat marks). Lockers can be opened on the back by anyone easily by simply moving the bed. Read that the showers are supposed to be awesome but the 3 I tried all barely had water pressure. common area is fine though and staff is nice. Breakfast is fine as well and location is allright but would not recommend the place. Geen fijn hostel. Tot diep in de nacht mensen aan het zuipen en schreeuwen. De voorzieningen zijn minimaal en ook niet goed schoongemaakt. Verder stikt t van de muggen op de kamer, die net op een gevangenis lijkt.